Culture & Tourism > Nakdong Estuary Eco Center > Information on the Ecology > About the Nakdong Estuary > What is a river estuary? An estuary is the place where a river or brook meets the sea. In other words, it's the place where the fresh water and the sea water gather together, a part of which is land and the rest is sea. In the estuary area, the fresh water of the river mixes with the salty water of the sea, and the salt concentration varies every moment. 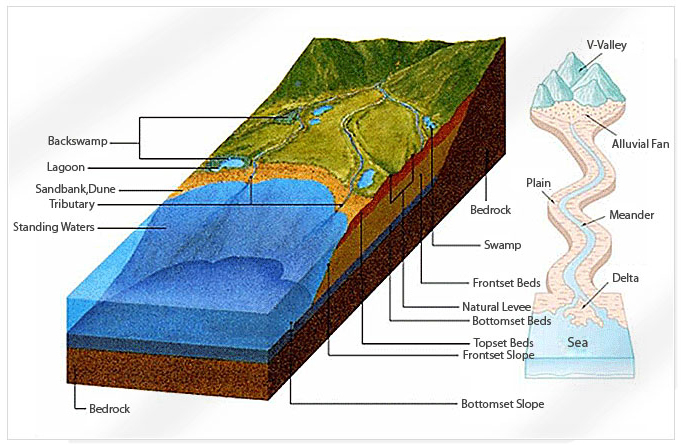 The region where the fresh water mixes with the sea water varies by the ebb and flow of the sea and the variance of the brook water, therefore the area cannot be clearly defined geographically. The salt concentration in an estuary, is diluted by the fresh water flowing down from the river, so it is higher than that of fresh water but lower than that of sea water, therefore it's called “brackish water". So an estuary belongs to the brackish water region. At an estuary, it is possible to to look down on the different types of fish living in the brackish, fresh and salt water respectively. This is the very reason why an estuary has high biological diversity. As it provides various habitats of different salt concentrations, it allows diversified animals & plants to become adapted to those environmental elements. At an estuary, you can come in contact with a variety of nature’s species. Natural embankments are well-formed at both edges of the river, around which there are swamps and marshes, and a lake called a “lagoon” can also be found nearby the land. Towards the seaside of an estuary a delta is formed, a river mouth and a tidal flat. A delta, where the sand & mud carried over along the river accumulates towards the sea, provides fertile soil rendering the area agriculturally rich. The tidal flat around the estuary offers abundant nutrition so thousands of animals & plants thrive there. Around the estuary tidal flat live salt plants like reeds, thus the scenery is beautiful and it becomes the habitat of migratory birds, providing abundant food.